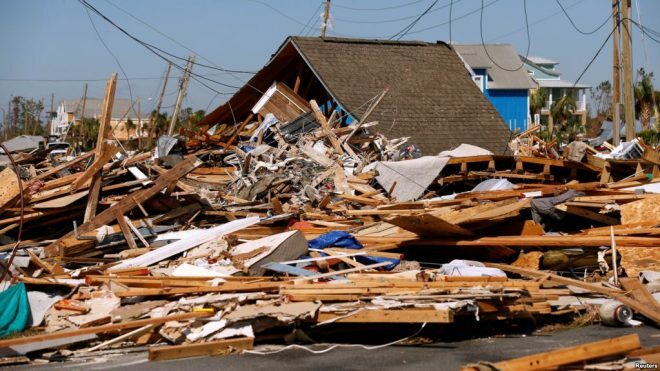 Panama City (Florida), 12 October : The death toll from hurricane Michael, one of the most powerful storms to make landfall in the US mainland, rose to 11 on Friday, with authorities warning that the number of dead could rise as emergency workers ventured more deeply into the areas devastated by the storm. Michael made landfall in the Florida Panhandle on Wednesday as a Category 4 hurricane — the strongest on record to hit the area — and charged north through Georgia and into the Carolinas and Virginia, wreaking havoc and causing emergencies. Rescue teams were in the initial stages of combing the region razed by a Category 4 hurricane that flattened blocks, collapsed buildings and left infrastructure crippled, the New York Times reported. Over 1.4 million homes had no power in Florida, Alabama, Georgia, Virginia and the Carolinas on Friday morning. The storm ripped apart entire neighbourhoods, reducing properties to rubble. Michael’s powerful winds and surging seas knocked row after row of Mexico Beach beachfront homes from their foundations. Federal Emergency Management Agency Administrator William “Brock” Long said that authorities as of Friday morning had confirmed 11 deaths in Florida, Georgia, North Carolina and Virginia. But added that this number could go up. He said that authorities were yet to fully explore areas like Mexico Beach in Florida, which he called “ground zero” after it was pummelled by the hurricane. Long said the storm posed a direct threat to people who ignored warnings and evacuation orders on the coastlines, particularly given the threat of storm surge capable of tearing apart and flattening buildings. Mexico Beach, a gorgeous beachfront city, now looks like an apocalyptic mess, according to survivors. As of Thursday evening, more than 900,000 homes and businesses in the country’s southeast region had no electricity. According to officials, tornadoes, dangerous winds and more flooding were possible in many of the same areas still recovering from Hurricane Florence in the Carolinas. Hurricane Michael was expected to dump up to 7 inches of rain in parts of North Carolina and Virginia, the National Hurricane Centre said.